Fly fishing is frequently an exercise in frustration. Ineffectual casting, uncooperative fish, bushes, ill winds, bad knots, that hole you didn’t know was there. Add in unfamiliar water and it can make you want to take up golf. I have driven far into Michigan’s Upper Peninsula to find some brook trout, based on some vague notions and a couple of memories. 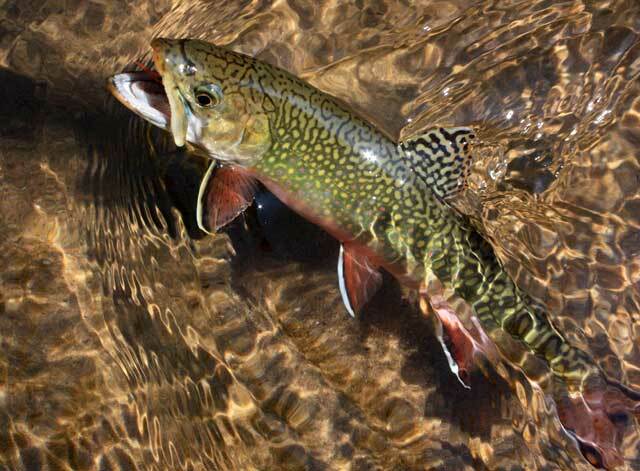 Memory number one is of finding brook trout on the upper Tahquamenon river years ago. It was starting to rain and I had no raingear, but I caught several fish in sight of the bridge, always a good sign. My notion was that I’d heard that the East Branch Fox river is top notch brook trout water and I wanted to check it out near the campground. Memory number two is that of finding a small unnamed waterfall on the Hurricane river that held fish in the plunge pool. I wanted to photograph this little stair step fall to prove it’s there and not something I dreamed up, and perhaps tease out a couple of more fish. So I woke up at 4 AM on July 4, made my coffee, loaded my car and headed north in the pre-dawn gray. The sun rose as I crossed the Mackinaw Bridge, back lighting the forms of departing thunderstorms. Haze hung heavy in the air, and I had to run the AC in my car despite the early hour. I stopped off in St. Ignace for breakfast, loading up on the essentials at the Holiday station—jerky, chocolate milk, juice, a banana, powdered sugar donuts and granola bars. I ate a leisurely breakfast during my hour drive north and west, past the boggy marshes and fens draped in fog, the tamaracks looking sepulchral, and I expected dinosaurs to lurch out of the mist at any time. 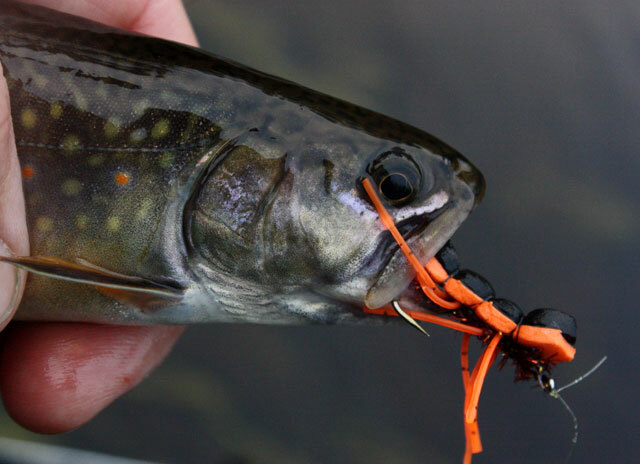 The Tahquamenon river may seem like an odd place to fish for brook trout. The Tahq most people know is a wide, often deep and powerful river with two sets of waterfalls. The upper fall is the third-largest waterfall in the U.S. east of the Mississippi. 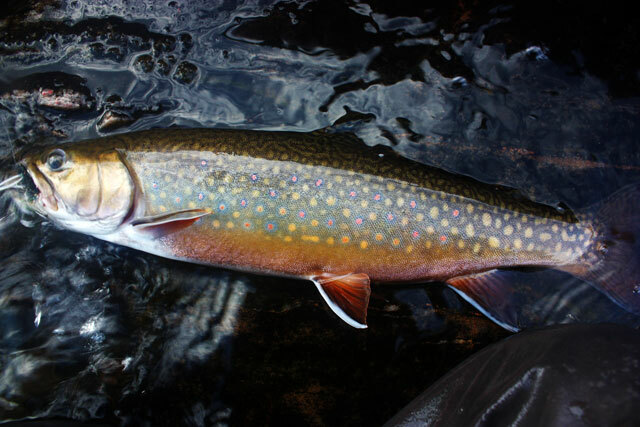 It is a great river for fishing, but is better known for its walleye, pike and muskie fishing than for its brook trout. My guidebook claims that the headwaters are decent brookie water, and having had some short-lived instant success years ago, I’ve been itching to get back and explore it more in-depth. I drive through all of the blankness of the east-central Upper Peninsula, past the cottages and small scattered homesteads; past the defunct motels, pastie shops and eateries, all boarded up and gone to seed. There are a lot of broken dreams in the UP, all of them dreams of prosperity through tourism. I wonder what happened to all of these abandoned enterprises. What inspired someone to build a large motel complex at Trout Lake for instance? It stands there pristine and weedy, a notion of success gone wrong, like soured milk—you meant well when you bought it, but it went unused, and now it is just involuntary cheese. There are lots of successful businesses in the UP, many of them having survived for decades in the toughest of environments, both physical and economic, but the UP is riddled with the skeletons and fantastic ruins of many a dream: hare-brained tourist traps, general stores miles from any population or even a cross-roads, motels, gas stations and eateries positioned on one tiny resource—a lake, river or scenic overlook—that when tapped out look like so many gold towns, withered into desolation. Some are simply plonked onto the roadside at random, the barricades, peeling paint and boarded up windows being all you need to know about their prospects. This desolation, the abandonment and defunctness, is part of the UP’s charm, your clue that the local population is holding their own, but that the crowds won’t be here anytime soon, and you just may find some decent fishing. When I arrive at the bridge crossing I park and get my first warning. Deer flies swirl in angry swarms. I grab my ugly but reliable broad-brimmed hat and step out. The air is surprisingly cool, but the humidity is choking, a pall in the air, and the deer flies are already an annoyance. My three weight is set up from my last outing. It still has that ugly orange Chernobyl tied on. I toss it into the deep water above the bridge and a big head rises to grab it. I get two more rises before I’ve wadered up, and so I race back to my car and try to make sense of a seemingly random pile of gear and clothing that ranges from front seat to back. Once I’m finally set up I wade in, the humidity already asserting itself as a presence, the water cool through my waders but not enough to take off the edge. I get some half-hearted rises to the Chernobyl right off, but a couple of fish are rising and so I switch to a small caddis. The fish ignore this utterly. I can see bright golden baubles, which I mistake for sulfurs, floating down the current . Finally, after being ignored by a third fish that continues to actively feed, I scoop a bauble out of the water. It is an iridescent emerald-green weevil-looking beetle. Say that ten times real fast. I then switch flies to a Joe’s hopper. If terrestrials are it, then I’m in. Two hundred yards of stream and some great holes wasted and I switch back to the orange Chernobyl. I get a slashing strike on the next cast from a decent fish. 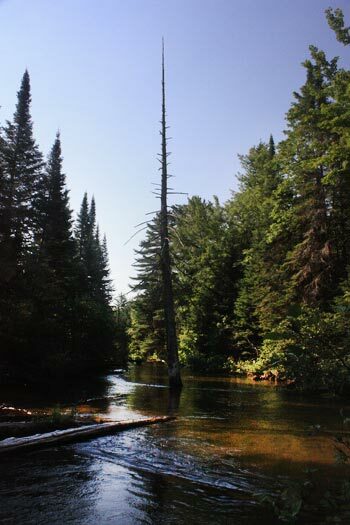 The Upper Tahquamenon river is not great brook trout water. It is open enough for casting, holds decent numbers of fat fish and has good in-stream cover, but its potential is limited. What it is is a pleasant morning spent cursing bugs, retrieving flies from tag alders, and releasing native fish back into their water. I caught 20-30 beautiful little gems, all of them bright green, with especially well-defined vermiculations, bright spots, and blue, blue halos. I don’t usually dish on river names, but I know that you won’t go. You won’t be able to find it, the bugs are too bad, the fish are too small, and the moose tracks on the side of the road as you’re walking out will remind you too much of how far removed you are from home. My chewed up elbows should be enough to warn you off, medals of honor of a battle fought and lost, blood spilled on the battlefield. Trudging out on a dusty road I was passed by one car. I waved, they didn’t. They were from Minnesota. When I reached my car I walked right past it, back to the bridge, and turned three more fish.